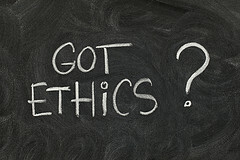 It seems nowadays that every one of my professors has something to say about ethics: how we are expected to perform with good conscience in a research or business setting, how we are supposed to handle a situation, what kind of values we are expected to live up to and other introspective questions have me opening doors I never even noticed in the world of morality. In short, college students are inundated with the idea of performing ethically. But it’s for a good reason. For one, we need to know how to function in a business setting, not in a school setting. We learn a good foundation of ethical behavior as students – We learn how to listen, how to learn and how to follow orders. However, a person can’t just get by on those concepts. There is a bit more one needs to learn to excel in business, like a sense of independence and a sense of honesty that doesn’t just extend towards your company or yourself, but to the people you promote your company to as well. Another thing to note is that lot of what we will face in the future won’t be so black or white. When it comes to communication, we are taught that downplaying the bad things and enhancing the good things is proper persuasion. But where do we draw the line in downplaying those faults? Do we have to disclose them every time? If yes, could that cost us a career? The Internet—arguably one of our greatest tools in PR—is a good example of this grey area. While it is a notably dubious place where the lies can intermingle with the truth seamlessly, it doesn’t give us leeway to post false information. Take for example the Yelp case. Back in February, Yelp started suing companies that get paid to post positive reviews for businesses. Though these businesses on Yelp may have a good product, and these reviews may follow suit with people who actually partook in the service, many can argue, and have, that this is a form of fraud. By “gaming the system” it not only destroys the small businesses’ credibility, it destroys Yelp’s credibility as well. Finally, these strong ethics need to be built in our heads now, because they won’t be as heavily enforced later. We may end up working for a company that thinks posting a fake review is its own form of reputation management. We may be put in a situation where it’s between telling the truth or keeping our livelihood. We need to not only have the strong sense of loyalty to ethical work but a strong sense of loyalty to ourselves. Once we have the courage to say, “no, this isn’t an ethical way of doing this,” we will truly be free as an individual and as a professional, and begin to change what others before us were too afraid to do. This guest post was written by PRowl Account Executive Kelly Armstrong.